i’ve had a crazy week at work. this weekend is memorial day, and ak, dave, bri and i are taking a road trip: friday night, bethel woods (home of original woodstock) for a phish show; sat am, ohio for lindsey’s wedding!!! so. 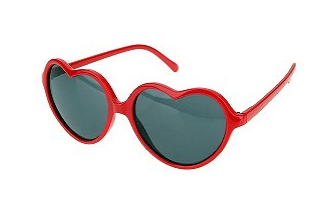 needless to say i’ve got nothing on my mind except: summer, summer, summer, summer; so i am going to go ahead and just post a pic of heart-shaped sunnies, which i’ve always wanted and never bought, even though they are like $9 and in every store on st. marks. what my weekend needs to consist of.